The irresistible ball of cuteness you see above is from a holiday gift guide list presented by Style.com. 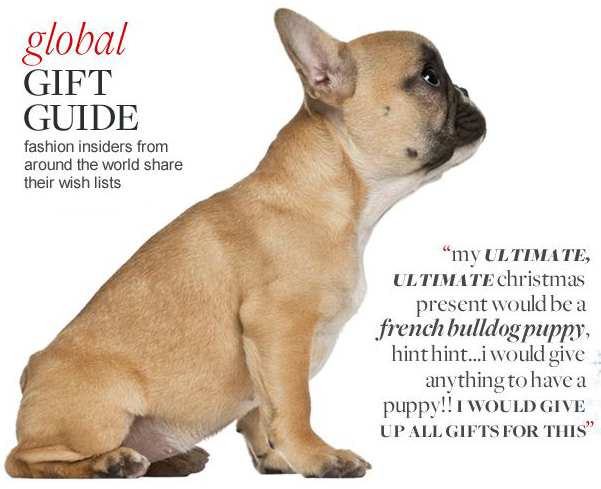 The site asked a number of fashion industry insiders what gifts they’d like to give and get this year and Christopher Kane CEO, Tammy Kane, listed a French bulldog puppy as one of her big wishes. This was a blatant confirmation of a trend that I’ve seen brewing for a while. The craze is one that’s especially near and dear to my heart because an awesome Frenchie named Marilyn (she was “blond”) was a part of my family for 13+ years. As a result, part of me is repulsed by the fad – taking a bit of offense to what looks like it might turn into what we saw a few years back when every other celeb and fashionista was toting around a little Chihuahua. I’d rather not even say her name in this space, but at the height of that trend a certain hotel heiress was known for changing her little pooches like she changed handbags. Disgusting. Dogs aren’t accessories; they are living souls and, hopefully, this trend won’t lead to any breeding exploitations. Trust me, these dogs are just as cute and even greater companions as adults. Check out the French Bulldog Rescue Network for info on how to adopt a dog that needs a home. As all true trends do, French bulldogs have invaded many facets of popular culture. 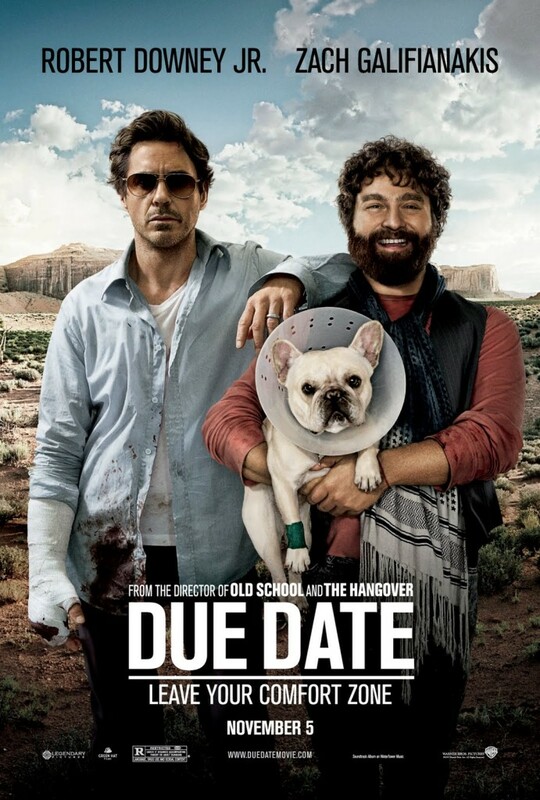 Below: a fashion editorial; Martha Stewart and her dogs do a Pet Smart commercial; and the movie poster for “Due Date” which features a Frenchie in a starring role. Amen. But sadly it already has. Please do continue encouraging folks to support rescue and to visit http://www.frenchbulldogrescue.org. I love you’re point of view here. It’s touching and adorable, they really are an ideal dog, companion, and loving ball of fur!